Additional product information can help increase the accuracy of the inventory forecast. 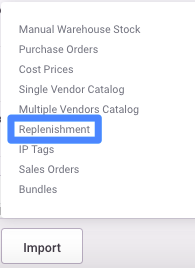 To remove items from your forecast that you do not keep in stock (including dropshipped or discontinued items), go to the Replenishment report and select items you wish to remove. The default view of your Replenishment report shows replenishable items. If you wish to view items that are non-replenishable, remove the Replenishable filter. If you have a spreadsheet of variants (SKUs) that need to be set as non-replenishable, you can import that information. 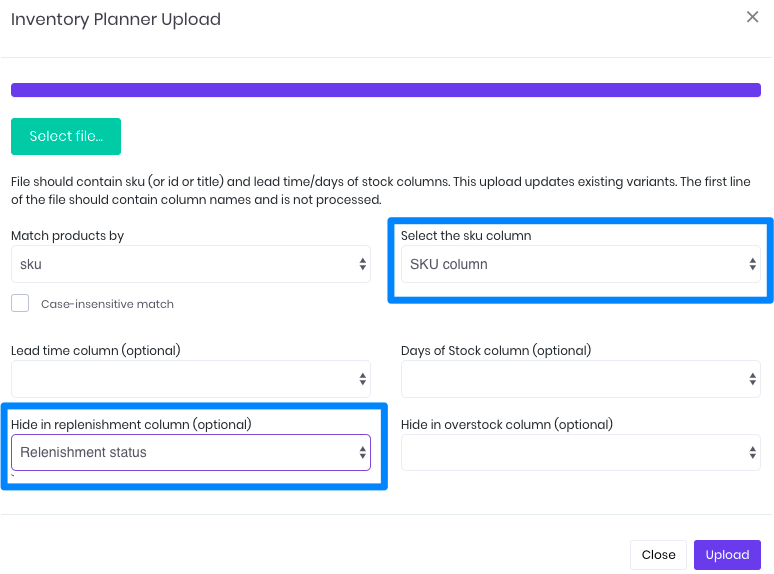 In your spreadsheet, add column headers indicating which are SKUs and which is the replenishment status. 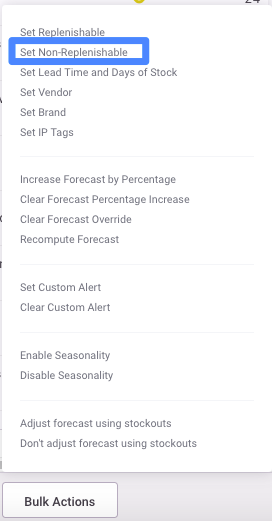 If you do not add headers, the first product in your list will not import correctly. In the replenishment column, add 'True' or '1' to indicate that an item is non-replenishable. In the Replenishment screen, select Import > Replenishment. Attach your spreadsheet and select the column headers for the corresponding field. Click 'Upload' to complete the import.